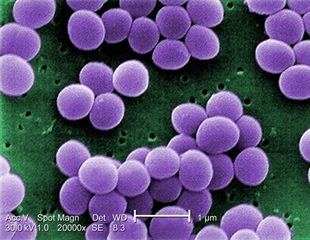 Staphylococcus aureus is a spherical bacterium (coccus) which on microscopic examination appears in pairs, short chains, or bunched, grape-like clusters. These organisms are Gram-positive. Some strains are capable of producing a highly heat-stable protein toxin that causes illness in humans. This article aims to provide a brief overview of the key themes of the 29th ECCMID conference and update readers on current research projects. Whether a wound--such as a diabetic foot ulcer--heals or progresses to a worse outcome, including infection or even amputation, may depend on the microbiome within that wound. The World Health Organization (WHO) recommends a 30 second application of a six-step hand washing and hand rub regimen that could keep infections away. New research presented at this week's 29th European Congress of Clinical Microbiology & Infectious Diseases in Amsterdam, Netherlands, identifies a novel association between antibiotic resistance and climate change. Since its implementation in 2009, the National Australian Hand Hygiene Initiative has seen significant, sustained improvements in hand hygiene compliance among Australian healthcare workers, and reduced risks of potentially fatal healthcare-associated Staphylococcus aureus infection, according to new research being presented at this year's European Congress of Clinical Microbiology & Infectious Diseases in Amsterdam, Netherlands (13-16 April), and published in The Lancet Infectious Diseases. Hospitals and nursing homes in California and Illinois are testing a surprisingly simple strategy against the dangerous, antibiotic-resistant superbugs that kill thousands of people each year: washing patients with a special soap. Infections caused by the Staphylococcus aureus bacteria through skin wounds cause thousands of deaths every year due to their fast transmission among large groups of people, such as hospitalized patients. With the advent of multi-drug resistant bacteria and lack of new antibiotics, researchers have been on the lookout for new molecules that can fight these pathogens. A team of researchers have now identified a slimy mucous coating of young fish as a potential source for antibiotics that could fight resistant infections such as MRSA (Methicillin Resistant Staphylococcus aureus). The research, conducted at the CEU UCH, combines molecular typology and QSAR methods as faster and more affordable tools in order to obtain new medicines and challenge the growing appearance of bacterial resistances. A new study has found that the ball pits used by children in physical therapy clinics may be colonized with various microorganisms, some of which are pathogenic. More than one-third of healthcare workers were contaminated with multi-drug resistant organisms after caring for patients colonized or infected with the bacteria, according to a study published today in Infection Control and Hospital Epidemiology, the journal of the Society for Healthcare Epidemiology of America. Many people view pollutants and pathogens as separate causes of illness. However, recent research indicates that the two can interact, changing how people and animals respond to infectious diseases. A new study identifies a single molecule as a key entry point used by two types of dangerous bacteria to break through cellular barriers and cause disease. A new study has found a possible link between the use of disinfectants in hospitals and the rise of methicillin-resistant Staphylococcus aureus (MRSA) on patient wards. Scientists at Aston University have discovered a technique similar to medieval stained glass-making that can completely eradicate the deadliest hospital infections within hours.